FSCamView is a handy application that is designed to help you watch the video captured by a video camera in full screen mode. It can be used for surveillance purposes when you only need to use a single video camera. If you need to monitor a web camera permanently but not always standing near your desktop, this tool is a good solution. Although it does not provide other functions it stretches the image to the entire desktop and it loads almost instantly. The program is very simple and it only requires a webcam connected to your computer.In other words, this tool allows you to get real-time feedback from a connected webcam in fullscreen mode. There’s probably no new laptop that comes out from the production line without a built-in camera. Even some all-in-one computers come with such a device. There are many management or viewing applications, such as FSCamView that lets you view everything your webcam captures, but in fullscreen. The application comes with at least an advantage. The first one is noticed right before the download process is done, because you can run it without having to go through a setup process. On the one hand, this keeps your computer clean, since registries are not modified. On the other hand, it gives you the possibility to use it on other computers as well, directly from an USB Flash drive. Running the application fills your entire screen with an initial status message, awaiting permission to use the webcam. Unfortunately, all text is in a different language than English, and not all might be able to understand. This is a drawback, because there’s a catch if you have multiple webcams connected. Given the scenario above, you’re stuck in a blank screen, constantly waiting for something to appear. What’s more, there aren’t any buttons you can press, and the only way to get back to your desktop is pressing Esc to close the program. However, this can be tweaked to your advantage. This happens in the event that more devices are detected. Unfortunately, the prompt that asks for the one you use is stuck somewhere on the desktop, and pressing Alt + Tab until reaching it doesn’t keep the window active. In case you do want to use it, press Win + D to minimize everything, and only open up the camera configuration window. Moreover, you need to use the keyboard to select the camera and confirm, because the cursor is stuck inside the blank screen. After confirming changes, the application instantly provides webcam feedback on your entire screen. To sum it up, a webcam can be used on a daily basis, with an abundance of viewing applications. 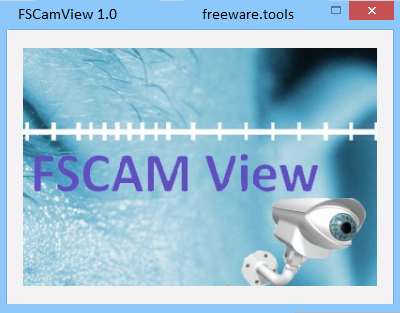 FSCamView aims to take advantage of your entire screen, which comes in handy for surveillance.